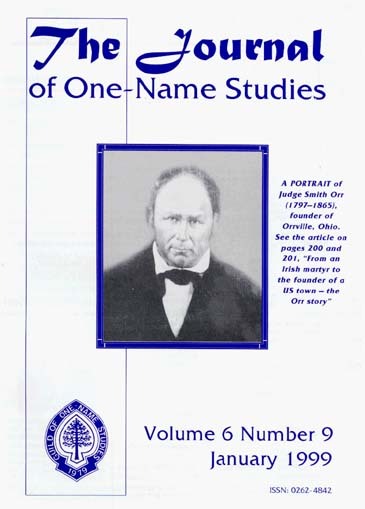 This article first appeared in The Journal of the Guild of One Name Studies and is now amended by the author. A One Name Study is the research in depth and collection of all occurrences of a name worldwide as opposed to the more familiar research of a particular person or descendants of one person or couple. It may sound difficult or complicated but it isn't really. The people who undertake One Name studies are enthusiasts of course - aren't we all, and in many instances they may organise and run their "name" family history society. But you can be a One Name researcher without undertaking a family society. What does it mean to begin a One Name study? A One Name Study is the research of a particular name, not necessarily your own - perhaps your husband or wife's line, or even no one related to you at all. The collection together and linking up of all persons with your chosen name would, in an ideal world , result in the finite family tree with all the connections made and verified. Is there a great deal of work involved for a common name? There can be: no one has started Smith for example, and the current registered names are selective and quite rare with some having less than a thousand records. Nevertheless, some people have started work on larger studies with world populations in the tens of thousands and more. What advantage is there in a One Name Study? There is a need for commitment to undertake a study as it has a much wider scope and opens so many channels of communication with other researchers. If you do research a blood line you will inevitably come into contact with cousins. They may be several generations removed but they are cousins nonetheless. It is challenging to be an authority on your name and very rewarding to be able to help people find their family roots. It is also totally absorbing, as you will invariably go off at a tangent intrigued by the surrounding history and events that influenced your family, perhaps explaining why they migrated or emigrated when they did. It is the ideal companion to researching your Clan. All clans have their septs - the smaller family groups associated with a clan. Why not research the family and sept origins as part and parcel of a One Name study ? A One Name study is also an alternative when you reach the genealogists "brick wall". When you have gone as far as you can on your direct blood lines and just cannot find Uncle Fred who "went to America" and joined the Gold Rush. It provides the opportunity to continue with your interest in history and always with the hope that one day the brick wall will finally crumble to reveal your wealthy ancestor! How do I go about starting a One Name Study? What is meant by registered name? There are two organisations that register One Name studies. The purpose is to provide a network for similarly minded researchers and a reference list that can be checked to see if anyone is researching that name. A particular name or spelling of a name is only registered once, but if already registered your offer of help may be welcomed with open arms by that person. Registration is therefore a resource for any family historian to use and may provide a shortcut for your researches. Membership of an organisation carries with it the obligation to reply to enquiries relating to your registered name (Self addressed stamped envelope or two International Reply Coupons should be included with the request ). I want to find out more ? Or you can visit the G.O.O.N.S website at http://www.one-name.org. The names ORR, ORE, OR and ORRE were at one time registered with the Guild of One Name Studies. I was their owner. I found that the task was too great for the time available and reluctantly decided to drop the collection of modern (post 1900) families in the USA. I continue to accumulate some records in searchable databases as well as donated family trees, and GEDcom files. Enquiries are cross referenced so that later matches can be advised to the original enquirer. I am willing to search my database, now exceeding 100,000 records, including my books, gravestone inscriptions and fiche for Scotland and Ireland, and to give advice when I can. An exchange of information is always welcome. I can be reached at brian@orrnamestudy.com Look here to read more about my extensive research on the Orr family name.